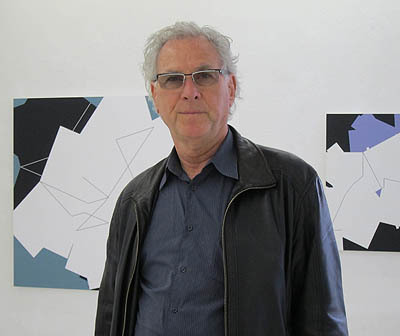 Manfred Mohr (Pforzheim, Germany, 1938) is a pioneer of digital art. A co-founder the “Art et Informatique” seminar in 1968 at Vincennes University in Paris, his art was transformed by the influence of the writing of Max Bense, which lead him to work on computer-generated algorithmic geometry. In 1969 he programmed his first computer drawings and in 1971 his first major museum exhibition, “Une esthétique programmée”, took place at the Musée d’Art Moderne de la Ville de Paris. Forty years after this landmark show, which is being revisited in an exhibition at the bitforms gallery in New York, Mohr continues to develop a constantly evolving body of work that has received many international awards. In the following interview, he shares with us his privileged perspective on the history of digital art and some insights about his work. 1. Your work seems to refer to abstract compositions, yet as it can be seen in your early work Zerreisprobe (1960), you have found inspiration in everyday objects. To what extent do you consider your work to be abstract? 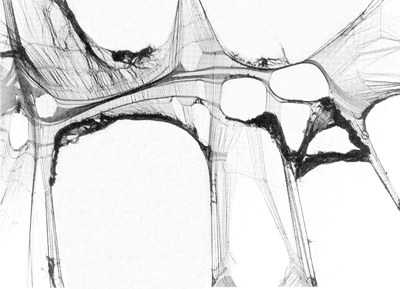 Have you been interested in the geometric structures that can be found in nature? I am profoundly interested in abstract relations. An abstract construct, for the purpose of my work, is a visual entity created or invented from a set of rules showing new relations and meanings as well as solutions. An abstract entity is therefore never a re-interpretation of a world we already know. It is, so to speak, a door to the unknown of understanding human thinking. An abstract content of a work is the purest form of transmitting aesthetic information. It excludes unnecessary associations and brings interpretation to a new level of communication. Just a little side step in time: As a little boy, long before I was interested in Art (or even knew what that was) and pollution was not yet an everyday word in the dictionary, I was walking with my parents in the black forest, passing a wonderful open field, when I suddenly saw (and I remember this very vividly) some crumbled white tissue papers laying in the grass. My parents saw that too and got very agitated about this misbehavior… But I saw it as a beautiful visual sign, a trace of human intelligence, a juxtaposition of “man-made” versus “nature”. You see: Nature was even then not a source of my inspiration…. 2. As Frieder Nake states, you have been extraordinarily supportive in helping art critics and historians classify your work. Do you think that it is necessary for an artist working with computers and new media to establish connections between his work and the history of art? In your opinion, how important are the links to mainstream art movements to understand your work? I think that any serious artist is by definition linked to “art history” and to his or her “time”. As for my basic influences, I could state, that the “Art Informel” of the 50’s and 60’s and later the rationality of Max Bense’s thinking, the theory of “Atonal Music” as well as the algorithmic music of Pierre Barbaud have strongly formed my background. Anything an artist does, no matter how it was made, should be related and positioned to the mainstream of artistic developments. Not so much for its understanding but for its relevance and/or importance in general. 3. You once stated that your work is always the result of a calculation. How much of the process of this calculation must be known in order to understand your work? Is it necessary, in your opinion, to describe the algorithm that generates each work or does it stand as an “independent abstract entity”, regardless of the way in which it was generated? I am in the unique position not only to show an aesthetic result but also to communicate/talk about the logical content of my work. It really depends on how much a person wants to know about the work. Talking about the logical content is really only a description of how it was made…. I think knowing how something is made can help to appreciate a work, but does not necessarily guarantee an understanding of the aesthetic power of a work. 4. Although, as you state, action painting and free jazz are the main inspirations of your work, there seems to be little room for improvisation in the process of making each work, as the algorithm establishes the main rules and random parameters are limited so that they cannot alter the structure. How do you create a balance between control and randomness? The “balance between control and randomness” is easy to explain. Controlled decisions, which reflect strong personal choices, are decisions which are imposed by a logic (for example permutation, or any other system one can invent). Random decisions however, become desirable when there are decisions to be made, of minor or of no particular importance to the flow of information. An example: You want to travel by train from Paris to Rome. You buy a train ticket (controlled decision). What happens during the train ride are mostly random decisions… All you know you want to get to Rome but things can happen along the way you have no idea. Maybe you meet someone; maybe you break your leg… Or, I want to draw a cube: the structure of the cube is imposed by its own logic, where as the rotation in which I want to present the cube is of no special importance; therefore I let the computer choose the three rotation angles randomly. I once called these random decisions the “whip” which keeps the program running…. 5. In the series space.color.motion (2002-2004) and subsets.motion (2003-2005) you introduce movement in your compositions, which in my opinion visually expresses the nature of your work as an ongoing process. What value does motion have in your work? How does it relate to still pieces? Again you understood my work perfectly. Since the beginning of my computer related work, the character of motion was always inherent, but I was not too eager to show a development of the signs in time. The visual processes were mostly presented in series, or so to speak in a step by step development where one can go visually forward and backward in his or her time to freely contemplate each sign. Each sign is an instant of the program! Only around the year 2000, I realized that the complexity of my work rose to a point, that I could not communicate to the viewer this content in an easy visual way. I decided to render this development of signs (images) in a real time movement on flat screens to visualize this complexity in a specific and adequate way… I think I succeeded, because the viewer suddenly could “feel” (through the movement from instant to instant) the complex structure even though he or she does not really understand it. The colors in these moving images are there to facilitate this process, and should only be seen as distinctions to show forms and relations. The colors are always chosen randomly by the program. 6. As you state, you leave room for imaginative associations in your work. Do you think that the use of colour enhances the possibility of establishing these associations? Has the use of colour altered the reactions towards your work? As I stated in (3) the “content” of my work is one thing, the “visual information” is something else. The viewer brings his or her own knowledge and preferences in contemplating over my work. I have no idea of how much the color would add to the individuals’ imagination. 7. Your animations are presented in the gallery as flat screens hung on the wall with the computers lying on the ground. Does this simply solve a technical requirement or do you intend to give a presence to the computer as a constituting element of the work? Would you rather have just the screen, with no cables or external elements? In that case, do you think that the flat screen can be the canvas of the 21st Century? I like to show the screen with the moving images (calculated in real time), together with the computer standing on the floor like a partner in crime, as “one work”. My new work (2011), however, does not use a PC but a Mac Mini, which I built behind the screen, and is therefore not visible anymore. I can accept this possibility too! You are right: The screen could be seen as a modern canvas! 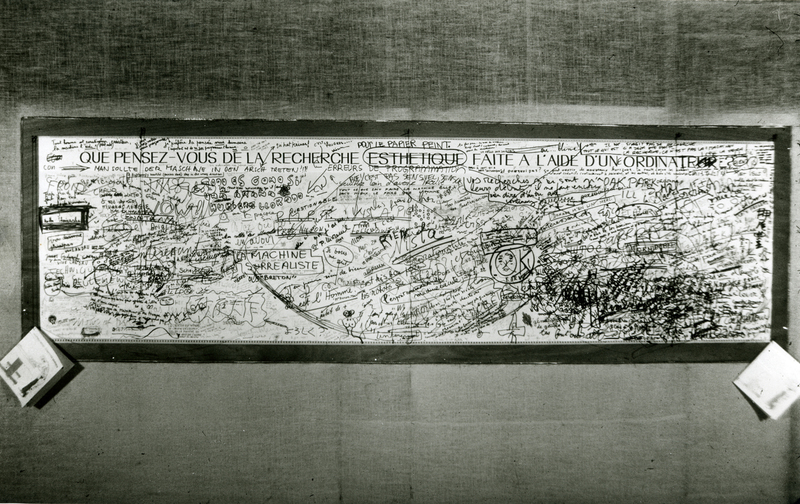 Wall panel at the exhibition "Une Esthétique Programée", ARC - Musée d'Art Moderne de la Ville de Paris.. Photo taken on last day of the show, June 6, 1971. © 2011 by Manfred Mohr. 8. When you exhibited your work in 1971, the commentaries of the people who visited the show were quite aggressive (as seen in the white panel mounted at the exhibition hall). In your experience, how has the acceptance of computer-based or new media art evolved over the last decades? Do you think that the mainstream art world ignores this kind of art? The aggression of 1971 is mostly gone, but a hidden resentment, when one is reminded that this or that work is created by a machine, is still prevalent. This is especially true, I am sorry to say, in the field of art history! The mainstream mostly accepts this kind of art rather well. In photography for example, there is no detectable problems of the sort anymore! 9. Over the years, you have worked with different computers, operating systems, programming languages and printing devices. How have you preserved the programs from your earlier works? Have you migrated them to newer platforms? Has the use of new printing techniques or programming languages altered the output of your compositions? I have written programs in a variety of languages and worked on many different computers. Since the beginning I mainly worked in FORTRAN. My Fortran programs are still usable and I seldom rewrite a program (subroutines, etc.) but use the Fortran routines and wrap them with other languages. It does not matter which language one uses, they all do essentially the same thing. New technologies (including computer languages) may facilitate things, but in principle, do not really alter the work or aesthetic thinking itself. In fact, new technologies can also be very tempting to get lost in the marvelous details and possibilities, resulting in (dangerously) missing the point and direction of ones original artistic ideas. 10. What is your opinion about the work of younger artists who create generative artworks based on algorithms, as for instance Casey Reas? And what do you think about the Processing software? I personally never used the processing language. I know Casey developed it and Frieder Nake teaches the language and talks positively of it. I understand the theory of the processing language, but I do not think it’s necessary for me to use it any time soon.